Christie has published and released The Book of Transformations, a highly-visual, coffee-table-style book that explores and celebrates how artists and technicians are using powerful projection display technologies to visually transform familiar structures and objects. The Book of Transformations provides key visuals, core plans, and technical details on scores of projection mapping projects done around the world using Christie projectors and complementary enabling technologies. It is available as a free downloadable app across multiple platforms, a PDF file, and as a limited release hard copy publication. Through more than 70 case studies, readers learn how giant office buildings, ancient temples and churches, landmark towers, bridges, performance stages, and even athletic playing surfaces have been re-imagined and truly transformed using "light paint" and the creative genius of event producers and artists. Projection mapping involves creating an accurate, virtual version of a structure, and then using powerful professional-grade projectors to transform the characteristics of that structure using painted light and motion graphics. The tablet version of The Book of Transformations includes images, embedded video, and detailed narratives of how various structures and surfaces were mapped, recreated in software, and then given entirely new appearances using powerful projected light. The Book of Transformations also traces the history of the art form, provides an extensive primer on how projects are conceived and executed, and looks at the future of the technology and medium. The free tablet app is available on Apple’s App Store for iPads and Google’s Play Store for Android tablets. A non-interactive PDF is also available free of charge, allowing all the showcases and supporting material to be readily viewed on other tablet devices, as well as PCs and laptops. The book follows the early 2013 release of Christie’s The Book of Shapes, which explored the projects and possibilities of the Christie’s groundbreaking Christie MicroTiles modular displays. Featured projection mapping displays include iconic landmarks like the Sydney Opera House, the Eiffel Tower in Paris, St. Basil’s Cathedral domes in Moscow’s Red Square, and the La Scala opera house in Milan. 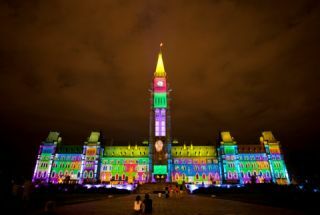 There are also Middle East mosques and temples, grain silos along Canada’s St. Lawrence River, and an old courthouse in Chile – all brought to life with projection mapping. The book also shows how motion graphic artists and technical producers push the boundaries of projection such as in South Korea and Singapore where water vapor has served as the digital canvas. In the U.S. and Spain, new motor vehicles have been tightly wrapped in fabric and magically transformed through multiple projections and the imagination. Christie’s 3-chip DLP projectors are used around the world for projection mapping. A wide choice of resolutions and brightness levels lets users project rich, evocative displays on almost any structure or surface. Christie’s range of projectors feature up to35,000 center lumens, and are equipped with either Xenon or mercury illumination, meeting the requirements for applications of any size and budget. Christie Twist technology allows users to warp and edge-blend projected images onto irregular shapes or surfaces, and complicated multi-projector setups are made easy using camera-based systems such as Christie AutoStack™.